How much do we know about Hatake Kakashi (はたけ カカシ)? His cool and calm demeanor only heightens the mystery surrounding this shinobi. 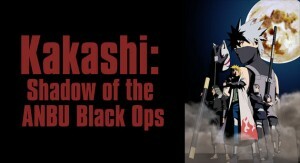 As a treat to Kakashi fans, Kakashi will star in his own arc in Naruto Shippuden (ナルト 疾風伝) on February next year entitled Kakashi: Shadow of the ANBU Black Ops. So, what do we know about Kakashi-Sensei so far? This jonin (上忍) is Team 7’s teacher and leader and is predominantly known for his Sharingan (写輪眼) eye which he received in his earlier days from Obito Uchiha (うちはオビト). Kakashi’s signature move is the Chidori (千鳥) – a technique that requires lightning chakra whose name is based from the sound of birds chirping that emanates from the concentration of electricity. Later on, Kakashi taught Sasuke Uchiha (うちはサスケ) how to use the Chidori. During free times, Kakashi can be seen reading Icha Icha (イチャイチャ) and is a huge fan of the series. Might Guy (マイト・ガイ) sees him as a rival while Kakashi sees him as a nuisance. Kakashi is also a former member of the Ansatsu Senjutsu Tokusho Butai (暗殺戦術特殊部隊), otherwise known as the ANBU (暗部). Shonen Jump (週刊少年ジャンプ) has announced the news in their official website with this awesome promotional art. Kakashi’s arc will give us more details on his personal history as well as give more details regarding the equally mysterious ANBU. Can’t wait for the New Year to start so it’ll be a month closer to February? You bet! Stay tuned for more updates here on Asgard Anime!